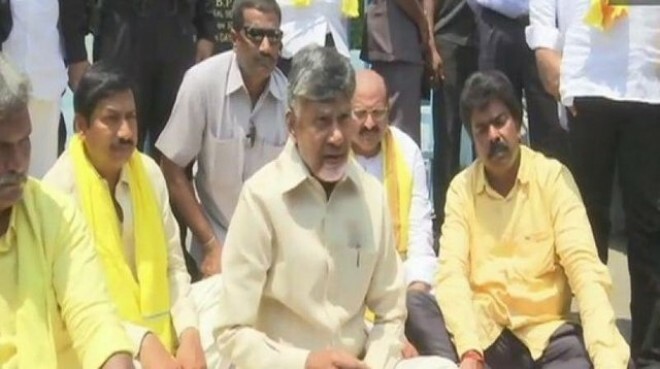 Vijayawada, Apr 05: Andhra Pradesh Chief Minister N Chandrababu Naidu is on a protest in Vijayawada over reported I-T raids on Telugu Desam Party (TDP) candidates and supporters on Friday. "Raids are being conducted on TDP leaders on instructions of Prime Minister Narendra Modi. Once elections are announced everything has to be conducted under the guidance of the Election Commission. All parties should have equal opportunity. They cannot support one party and suppress another. This is a violation of fundamental rights and the spirit of elections," he said. Endorsing veteran BJP leader LK Advani's recent blog, titled "Nation First, Party Next, Self Last", Naidu said PM Modi should take lessons from Advani. Simultaneous elections will be held in Andhra Pradesh for 25 Lok Sabha seats and 175 Assembly seats. The results will be declared on May 23.